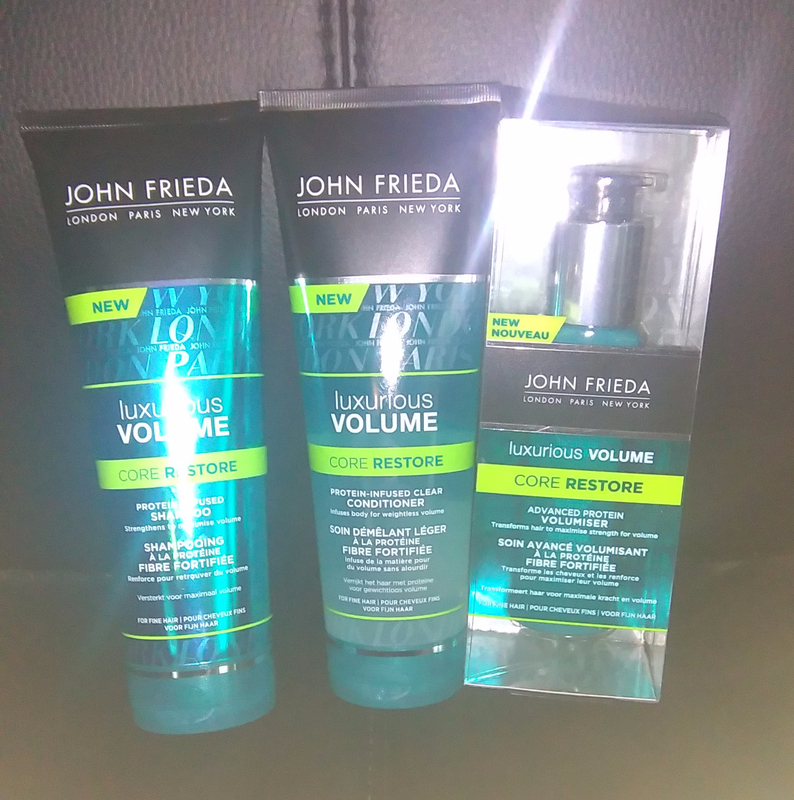 After receiving my free samples of John Frieda Luxurious Volume Core Restore from Bzzagent, I have to say, I was really looking forward to testing it out. For a start it has been years since I have actually spent any serious money on hair care products and though I used to use John Frieda products in my clubbing days and liked them, for some reason I just don’t really splash out anymore. I guess this is what happens when you stop going out and start living on a budget, darn getting older! Upon first investigation of the freebies, I found that I had a shampoo and conditioner which I would usually use but they had also given me a volumiser treatment, so I put that to one side as I had no idea where my hairdryer was packed away: I always feel it wastes time, so I tend to leave it to dry naturally. First impressions: The packaging is sleek and modern, and something that I can imagine on the shelves of an expensive hair salon. For me personally, it actually reminded me of some men’s shaving gel we had hanging around, and I was hoping that I wouldn’t get confused since the conditioner is actually a clear gel too (looking at them now, I would consider myself an idiot if I did). The shampoo smelt fresh with that almost cucumber type smell (not my favourite) which most people like, but the conditioner smells a little more chemically, like you would expect from a salon product. The smells do lessen after applying to the hair and drying though. The most important thing for me was that it’s usable on coloured hair: so a big thumbs up for that. I first tried using the shampoo and conditioner as I would normally; leaving my hair to dry naturally. I found after this, my hair felt sticky: as though I’d used lots of hair product which I didn’t like at all. Next time I tried them, I used less product as they do seem to lather up very well and I thought that maybe I wouldn’t need so much as other conditioners: usually my hair is quite dry and I seem to use more conditioner than shampoo. After using less of the conditioner I found this did seem better but still my hair didn’t feel natural. On the plus side, it did actually add more volume: my usually flat hair definitely had more of a bounce to it which was a nice change. I continued to test using differing amounts of the shampoo and conditioner and found that I could even go without using the conditioner which seemed unusual for my hair type. Using only the shampoo, my hair still felt moisturised and soft with added volume. If I used a little of the conditioner afterwards it did work out a lot nicer for my hair and added extra boost but I was getting a little concerned that it didn’t smell as nice or feel as natural as my normal brands. I should point out that it was only me who felt this though and both my boyfriend and mother didn’t see any difference, so maybe it was just a personal preference. My mother did notice the difference in the volume added: as usually my hair is very fine, so any bit of extra body is quite visible. Then I decided I should be trying all three of the core restore collection to gether for maximum results. After finding out my hairdryer, I have to say that I wasn’t disappointed by the results. The volumiser treatment was nice and easy to use, and I liked that it was a pump action gel rather than a spray type which seem to produce more waste and mess. I also liked that the bottle was a good size to handle and seemed a good fit to put in an overnight travel bag (unlike the shampoo/conditioner). For me personally, I don’t think I would use the core restore shampoo/conditioner instead of a usual brand, however I might put them into the rota (I tend to swap around brands). I think it’s something I might want to use for a night out to look good, but not to use all the time: I prefer a more natural feel to my hair. Also the price does not really fall within my weekly budget (unless it was on offer), so using it infrequently would suit me better on both levels. Overall the Core restore set were good products. They did give my hair extra volume and bounce as promised and I like the fact that a little goes a long way. My original good opinion of John Frieda has been reaffirmed: it is still a good brand which does what it says on the tin.